All our categories can be found in the sub-menu below – clicking on the category you want to look at will get you directly to that page. PLEASE NOTE: I measure all British, American and Japanese frames in inches ctt (centre to top) and convert to the nearest cm, conversely I measure all European and Italian frames in centimetres ctc (centre to centre) and convert to the nearest 0.25in. Do not assume that you will need a frame sized the same as your modern one – either seat tube or top tube. Fashion plays a great part in frame design and sizing. In the early years of the 20th century frames were sized as large as possible with virtually no seatpost showing … by contrast riders were advised in the 1920s to have as small a frame as possible. 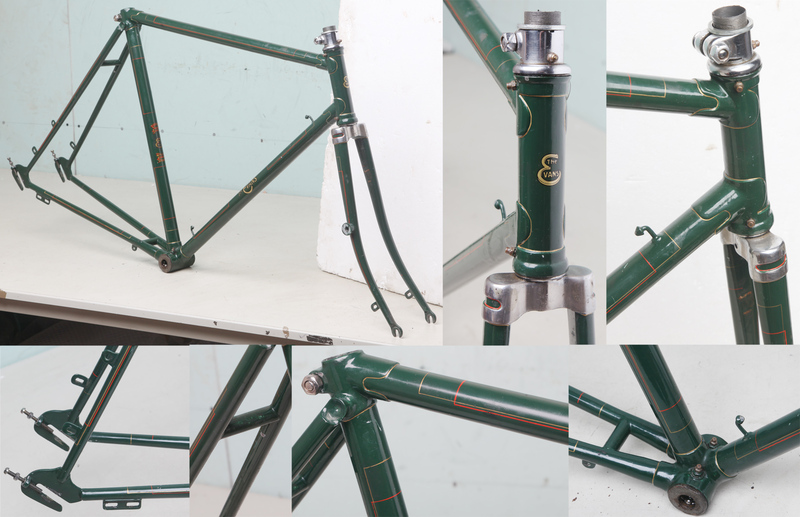 Race/road frames from the 1920s/early 1930s will generally be sized about 3–5cm smaller than a modern frame but with a much longer top tube and shorter stems. Towards the end of the 1930s larger frame sizes became fashionable – up to 2cm larger than a modern frame. Top tube lengths were still longer used with shorter stems. In the 1940s and 50s frames were sized a bit larger still – 3–4cm more than a modern frame still with longer top tubes and shorter stems. In the 1960s and 1970s frames gradually reduced in size until the late 1980s. At the same time top tubes began to get shorter and stems longer. I am willing to advise any customer on frame sizing with older frames. Please contact me at: hilarystone@hilarystone.com to check on availability and confirm shipping cost. Figures above are good estimates, rates may vary for some countries. CLICK ON the sale images to see a much larger picture! Frames are supplied as seen in the pictures unless described otherwise in the text. Please remember that these frames are generally at least twenty years old and sometimes seventy… In most cases I will know very little of their history but will attempt to describe any problems I can spot – if there are issues I have missed I will always work with the buyer to find a solution. All frames I sell are in track and straight, with excellent headset threads, bottom bracket shell threads and gear hanger threads if fitted. These categories may be qualified by more detailed description in the text. Excellent A very useable frame with no obtrusive marks to the paint and no dings or dents. Chrome if present will be free of serious marks unless stated otherwise. 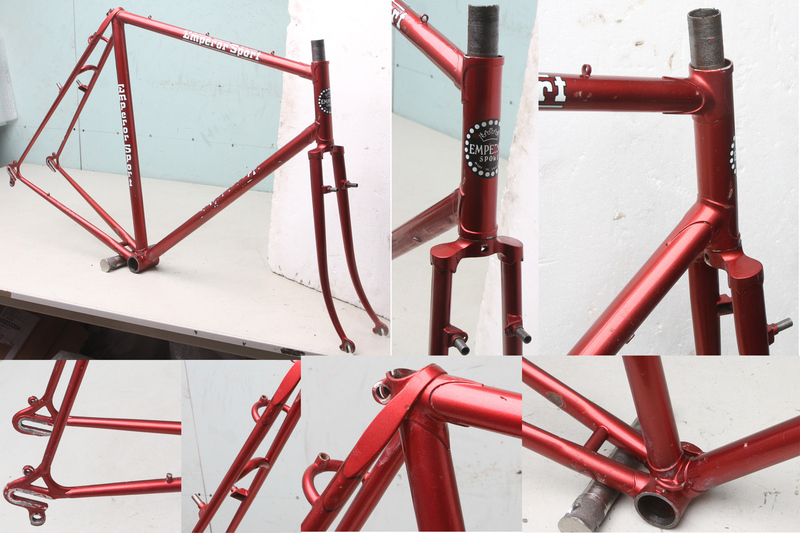 Very Good Perfectly useable frame but with more marks to the paint and chrome if present. Some of the marks may benefit from careful retouching. Generally there will no dents or dings but if present will be small. However if you are concerned about dents/dings with frames in this category please ask me to do an extra check. Sound Paint and chrome may need redoing depending on how you like your bikes – I appreciate frames with patina which show their age but others may want to repaint. There may be a small ding or two but nothing very significant – older frames often pick up smaller dents which are of no significance to their strength or life. Any more significant dents will be described in the text. Needing repainting Paint will be poor and in my opinion is not saveable. There may be a small ding or two but nothing very significant – older frames often pick up smaller dents which are of no significance to their strength or life. If there are larger dents they will be described and/or pictured. These are all easily filled by a good framebuilder or frame painter at very little extra cost. For frame without headsets or where you'd like a headset replaced I can offer a fitting service for £15. Please see the headset pages: http://hilarystone.com/headset.html for what is available but please bear in mind that you may need advice on whether a particular headset will fit your frame especially in relation to stack height.